We managed several walks on different weekends. It was generally easy to walk across the fields from home or along the local canals. 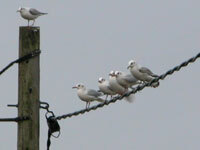 At this time of year the seagulls come inland in the hope of some easy food. Northamptonshire countryside is a well kept secret and we enjoy walking from the house across the fields or along the nearby Grand Union canal. At this time of year the weather isn't conducive to cycling but Jane will get out on her bike as often as she can as long as it isn't raining too much or it isn't too windy. A new James Bond - neither of us were great fans of the genre until Pierce Brosnan took up the role. 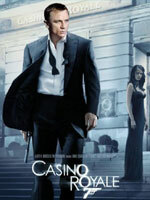 Casino Royale had mixed reviews but Jonathan Ross on Film 2006 was positive so we thought we'd give it a go. The first 20 minutes was non stop action however after a full day at work Jane still managed to fall asleep. "Daniel Craig's performance as James Bond has been hailed as 'terrific' and 'simply brilliant' in early reviews of his 007 debut in Casino Royale. The first verdicts on Craig - who was a controversial choice to play the spy - have been gushing. The Daily Mirror said he was seen 'oozing the kind of edgy menace that recalls Sean Connery at his best'. And the Daily Telegraph wrote that he 'steps with full assuredness into Sean Connery's old handmade shoes'." The thing about Christmas is that the run-up is interminable and then suddenly it's a week to go and the tree isn't decorated, final presents are still not purchased and the wrapping process is behind schedule. Of course Jane does all the hard work of thinking of what to buy, sending the cards, wrapping the presents, organising the deliveries. All Steve does is purchase a few obvious things for Jane and then moan about how stressful this time of year is... and what's so bad is that the older he gets the worse he gets. 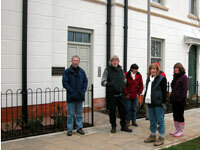 On the 25th we walked over to Dave & Lucie's new apartment at Upton for dinner. We had a pre dinner walk but the ground was so wet we soon returned because we were getting bogged down in the mud. Unlike what is depicted on TV and films it rarely snows on Christmas Day in England and it was reported that in the East Midlands we are only likely to see 4 white Christmases in our whole lifetime. The ten of us sat down to a huge dinner with plenty of wine flowing throughout the afternoon and evening. We played games, drank wine, watched TV, drank wine, played more games, fell asleep, drank even more wine and eventually headed for home. We were grateful for a lift home from Martin & Kate because it would have been a difficult walk back in the dark. 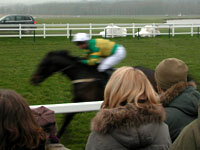 To avoid the anticlimax of Christmas we decided to go to the races on Boxing Day. Neither of us have ever been to a horse race even though Towcester Racecourse is only ten miles away. Yes it was cold and overcast and we had to walk from Towcester because the queues of cars to enter were very lengthy but it was worth it. Steve doesn't go along with gambling because the odds are always against you but Jane revels in a gamble and was happy to play "bookies runner" to the on-course book makers before each race. The first races were over hurdles and therefore there were inevitable falls but it was very dramatic when it became obvious that one of the fallen horses was not getting up. Some way down the home straight a black sheet was erected and one can only assume the horse met its end. There were also some financial losers amongst us with only Dave managing to cover the entrance fee and bets. 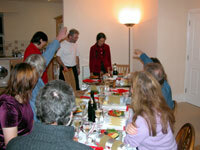 New Year's eve and everyone turned up at The Pig Yard for a roast beef meal followed by games and television to see in 2007. We started late and managed to recycle a lot of wine bottles before midnight. 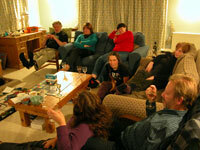 We watched Jools Holland until the early hours and people started leaving at around 2 am. Martin and Kate stayed overnight, we did expect a few more overnighters however Nick volunteered to be taxi driver so he delivered everyone safely to their respective homes. The following morning was used for clearing away the debris, washing up and getting the house back into the usual routine ready for work the next day. So what are we looking forward to? Each year is always punctuated by excellent holidays - this year we've said we won't go abroad at all however our resolve to stay in the UK is already slipping with discussions involving Venice and Florence. We also intend to visit Edinburgh for the festival in early August with the possibility of visiting Tony and Jude in their new home outside Elgin. Before this we've got our February holiday with the usual suspects and this is only 5 weeks away - great. Of course work gets in the way of life and Steve looks as though he will be busier than ever with some significant pressures on him and high expectations to deliver some major changes. Jane will no doubt extend her work and social activities with who knows what. The house needs some work doing on it - first off is redecorating the entrance hall, stairs and landing. We must also seriously consider changing the kitchen, this will be a major disruption to our routines which will no doubt affect Steve most - he doesn't like disruption or mess. As always we'll keep all activities recorded and updated on the web site and we may even use the blog more.